I have been on a mission to help my fellow dentists achieve the success they truly deserve for a number of years. I have been doing this predominantly through keynote speaking, group coaching and my premium coaching for individual dental practices. From time to time as I travel the world being of service to clever dentists, I come across new technology and new systems that can assist dental practices in billing more and also providing a better customer experience. On this page is a list of resources that I recommend you check out to see if they can add value to your practice. 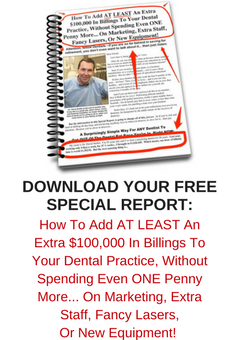 Want to boost your Dental Practice reviews? Prospective clients and search engines alike want to see consumer reviews about your business. Grow My Reviews is a proven system that generates a consistent stream of patient feedback, effectively promoting your professional reputation… effortlessly. The Grow My Reviews platform adds positive testimonials to your online presence, improves SEO visibility, helps you manage negative comments, and provides full analytics. Google, Facebook, Yelp, Realself, Avvo, Healthgrades, Vitals + More. Want to generate more website leads during non-working hours? Off Hour Patients works hard for you 24/7. This platform addresses the needs of your site visitors even while you are away. It makes them feel welcome and encourages them to engage more closely with your office. Doctors who know “the power of the moment” recognise the power of OffHourPatients.com! It starts a conversation with potential patients even if your away. And with every engaging response, the visitor takes one more step towards becoming your committed patient. Digital signboards let you express your heartfelt thoughts. They convey your message to the right audience. They are digital signboards, so they can be easily used on your iPads or tablets. If you would like to use the printed version of these signboards, you can print them as you prefer. These signboards allow you to have fun on Social Media sites & gain more fans. Overall they enhance the online presence of your business. Want Your Social Media Done For You? Save time and generate results all from one platform. DoneForMeNAP takes care of this vital requirement and helps maintain your business on top in search results. Achieve 100% nap consistency with DoneForMeNap.